Lest you think more highly of me as an artist than you should, I have to set the record straight. The photographs you see in my galleries are the cream of the crop of my pysanky. What you don’t see are my less than successful endeavors. Sometimes it’s not my fault. Sometimes the eggshell is damaged in a way that doesn’t show up until near the end of the process. That’s why I don’t use grocery store eggs anymore. Mechanical rollers leave invisible scratches on mass produced eggshells. 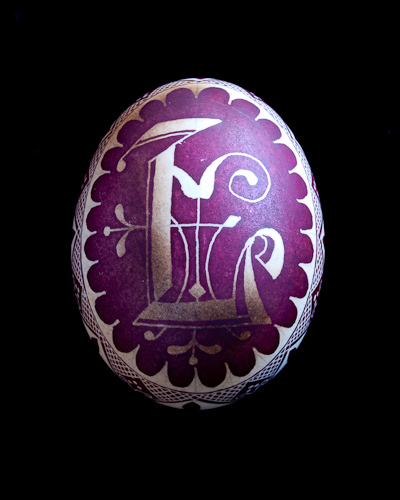 It’s very disheartening to put hours of work into an egg only to discover on the final dye that imperfections mar the design. Lots of times, though, it is definitely my fault. I have mistakenly covered areas in wax when I shouldn’t have. I’ve forgotten to cover areas with wax when I should have, which means they end up a different color than I had originally planned. I have also dyed the whole egg the wrong color and there is no “undo” button for that. Even finishing an egg isn’t any guarantee of success. More than once I have bobbled an egg just as I was taking off the final bits of wax. Sometimes they bounce on the table and stay whole, but twice I accidentally crushed the egg between my stomach and the table edge while trying to keep it from falling. And you can’t put Humpty Dumpty together again. The most irritating of all are mistakes I make from inattention or impatience. Last year I was in a hurry because of a close deadline so I put the egg in an oven with the light on, thinking the warm air would help it dry faster. I foolishly thought the light would also warn my boys to remove the egg before preheating the oven. They didn’t and there is no “undo” button for a burnt, browned egg either. Trust me. The photos here show a simple project that turned endless. 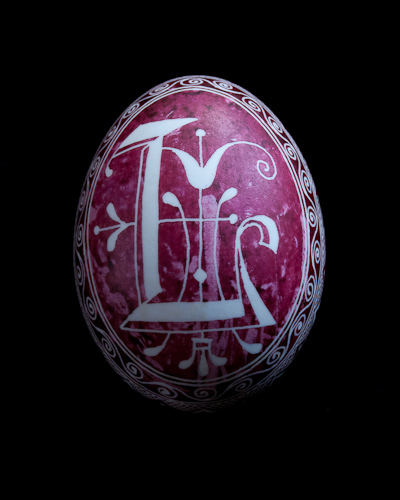 On the first egg you can see some unattractive dye imperfections from hen scratches. So I tried again. The second e gg burned when the tissue I was using to wipe the wax from the egg caught on fire. Egg number three turned out better than the previous two attempts but I was nervous the whole way through the process. Whatever the reason for these mistakes, there is something to be said for the character quality of persistence. And that’s what God is teaching me through this art these days.